One of SAML's greatest benefits is Single Sign-On (SSO), the ability to enable users to securely access multiple applications with a single set of credentials, entered once. SAML enables users and organizations to conduct business faster and more efficiently. However, implementing SAML SSO can be challenging for an organization. What is SAML and how it’s used for Single Sign-On. 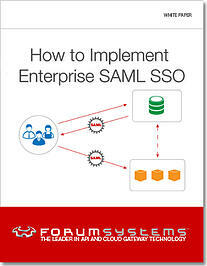 Two methods of implementing SAML SSO. The advantages and challenges associated with each implementation strategy.